The 3.5 adult men's team representing the Missouri Valley Section is hoping to see two championships for the St. Louis area this weekend. 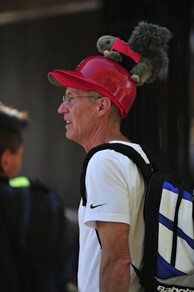 Team Captain Bob Faust shows his St. Louis Cardinals pride with his Rally Squirrel paraphernalia. TUCSON, Ariz. -- Over the past week and a half, the St. Louis area has gone nuts over the "Rally Squirrel," and the men’s team representing the Missouri Valley section has brought Rally Squirrel Fever to this weekend's USTA Adult League 3.5 National Championships at the Jim Reffkin Tennis Center. The squirrel has become the talk of the Major League Baseball postseason, after its appearances on the field at Busch Stadium during Games 3 and 4 of the National League Division Series in St. Louis. The first appearance briefly halted Game 3 as the squirrel ran around the outfield and foul territory down the third base line. The following night, the squirrel took over the national spotlight when it darted across home plate, as Philadelphia Phillies pitcher Roy Oswalt threw a pitch to Skip Shumaker of the Cardinals. Once Oswalt began to complain to the umpires that he was distracted by the squirrel, the St. Louis fans immediately fell in love with their new furry folk hero. St. Louis would go on to eliminate the heavily favored Phillies, and as the Cardinals continue their postseason run, the fans have begun wearing Rally Squirrel merchandise. T-shirts and hats featuring the squirrel are being sold throughout St. Louis, with the proceeds going to charities, and over 40,000 Rally Squirrel rally towels were given out to fans as they entered the stadium on Wednesday night. The squirrel even has its own Twitter account with more than 25,000 followers. Among those fans with Rally Squirrel paraphernalia is Bob Faust, the captain of the Missouri Valley squad competing in Tucson this weekend. As Faust traveled from St. Louis to Tucson on Thursday, he proudly wore a Cardinals t-shirt and a batting helmet with a squirrel stuffed animal attached to the top. He explained that he was stopped many times on his journey to Arizona to take pictures and talk with other fans who were interested in his Rally Squirrel helmet. "Going through the airports, I don’t even know how many times I got stopped to have my picture taken," he said. "I got heckled a little in Dallas during our layover because the Texas Rangers are still in the playoffs, but there are Cardinals fans everywhere around the country, so I got a lot of cheers." Team co-captain Roy Taylor had his own personal encounter with a St. Louis squirrel the night before the animal would make its grand appearance at the ballpark. He explained that he had left the window of his car slightly open, and there happened to be a bag of Cheetos in the front seat. When he returned to his car in the morning, he was greeted by a squirrel inside the vehicle, eating the food. Taylor feels that this was an omen for what was to come, with squirrels making appearances in unexpected places. The team has bonded on their trip to Arizona over their common love of tennis, the Cardinals and a fascination with their new local hero, and is making sure they aren’t missing the baseball action while they are competing in the desert. Faust added that he was hoping that the Cardinals playoff opponent in the NLCS would be the Arizona Diamondbacks so that he and his teammates could attend the games in Phoenix while they happened to be in Arizona for the USTA League National Championships. Unfortunately, the Diamondbacks were eliminated last week, but Faust and his team are following the action on television. Thursday night, the Missouri Valley men watched together as a team from their hotel’s restaurant bar, as their Cardinals took on the Milwaukee Brewers in Game 4 of the National League Championship Series. The team plans on also watching Games 5 and 6 of the NLCS in Tucson before they return home to the St. Louis area. They are hoping to see two championships for the St. Louis area this weekend: a tennis title at the National Championships and the National League championship for the Cardinals.